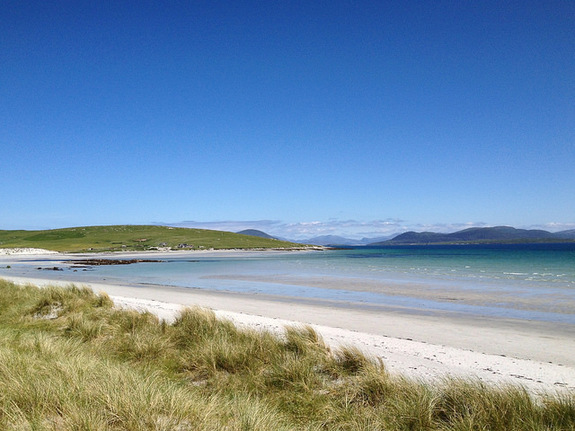 If you like your holidays to include breathtaking places to visit, it can be easy to overlook the UK. You live here, after all, and you already know about Stone Henge and Buckingham Palace. But aside from the most well-known landmarks that the UK is known for, there are some incredible, offbeat places to see in the British Isles. From the eerie to the tropical to the downright beautiful, here are ten of our favourites. From the outside, this huge cave looks a bit like sixties brutalist architecture. 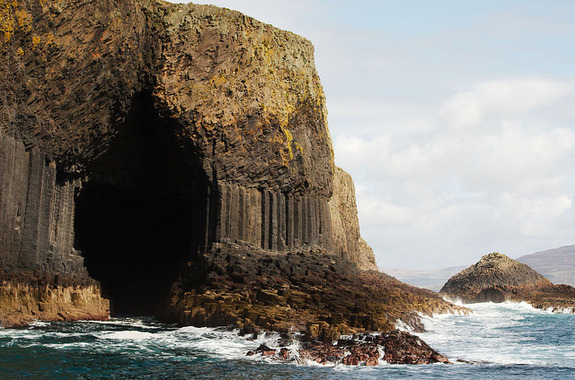 In fact, Fingal’s Cave, on the uninhabited island of Staffa, Scotland, is all natural. 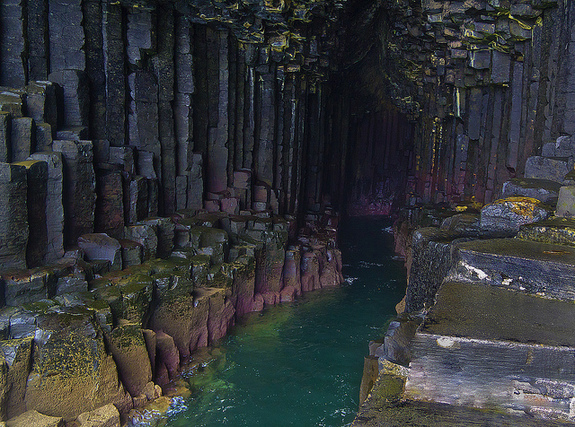 The fractal, hexagonal columns of basalt are the result of cooling molten lava. Aside from the wonder of the cave itself, from its entrance, you get a perfect view of the nearby island of Iona, as though the yawning mouth is Iona’s frame. With its columns, graduated terraces and turquoise waters below, this theatre looks like it should be in Greece. In fact, it’s in Cornwall, a few miles away from Land’s End. Minack Theatre was the brainchild of Rowena Cade, a local woman who wanted to provide the ideal backdrop for a local theatre company’s production of The Tempest, in 1931. 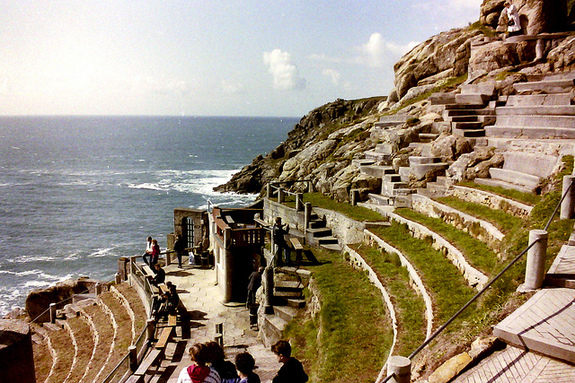 Cade arranged for a temporary theatre to be built at the bottom of her cliffside garden, and the production was such a success that the theatre was made a permanent fixture. 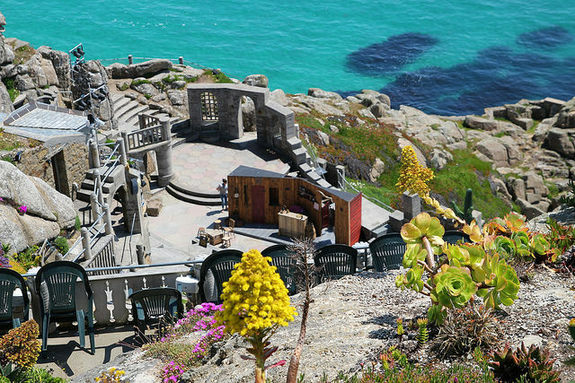 These days, throughout the spring and summer months, the Minack Theatre plays host to a full programme of productions, with theatre companies visiting from all over the world. These scenes might look like they’re from a tropical rainforest, but they’re actually in Cornwall (again). 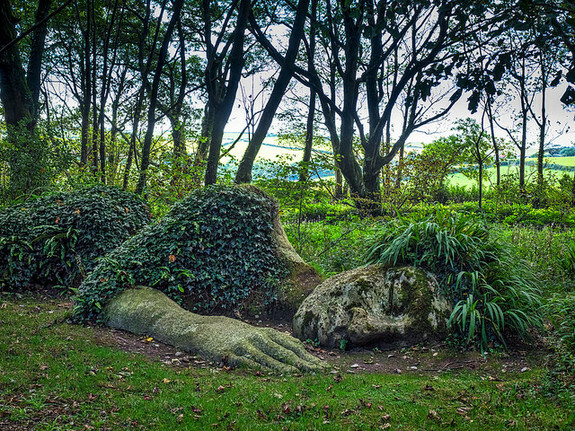 What is perhaps even more enchanting than the exotic scenery in the Lost Gardens of Heligan is the history of the place. Originally created by a wealthy family in the mid-18th century, the gardens were a celebration of vegetation and garden styles from all over the world. Sadly, they became neglected after the First World War, in which the gardeners charged with maintaining Heligan died. 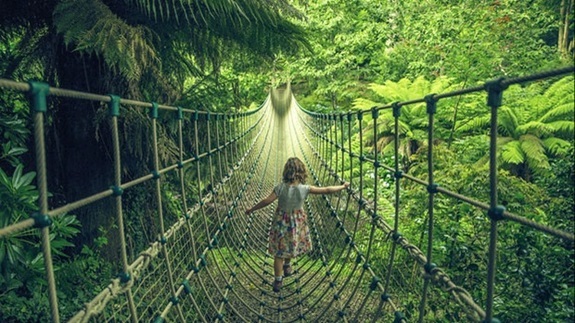 In the 1990s, though, as part of a reality TV show, the Lost Gardens of Heligan were restored to their original glory and are now open to visitors. Some of the magical places you can visit within its walls are The Lost Valley, The Italian Garden and The Jungle. Tread the cobbles between the brightly-coloured buildings of Portmeirion, and you could be forgiven for thinking you’re in Italy. 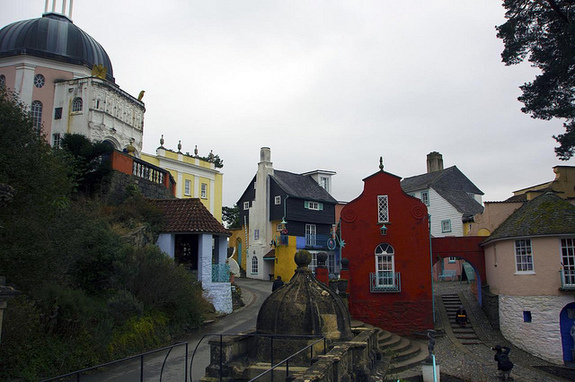 In actual fact, this village, clinging to a hillside over a swathe of blonde sand, is in Wales. 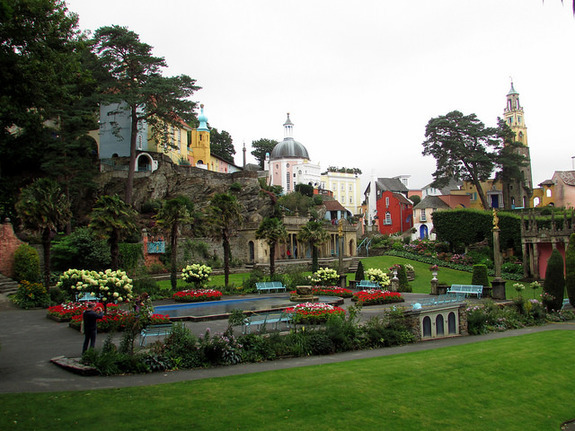 Built by eccentric architect Sir Clough Williams-Ellis, Portmeirion was the setting for cult sixties TV show The Prisoner. Today, this strange and stunning little place is open to the public. Every September, it’s the incredble setting for Festival Number 6, a music festival that makes partying in a muddy field look like dancing in the local church hall. If it wasn’t for the rust on the outside of these fascinating structures, you might think they’d arrived from the future. Standing on stilts high above the Thames Estuary, they look straight out of The Day of the Triffids. 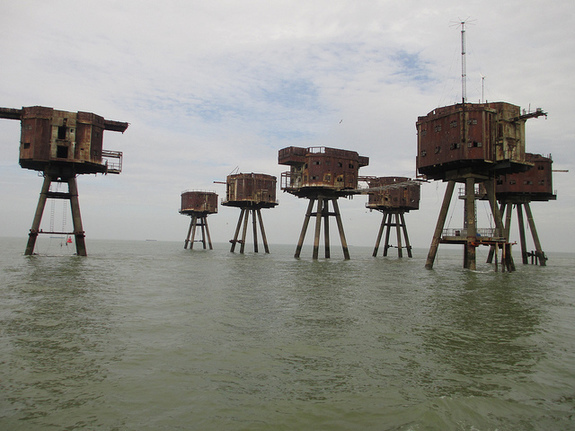 In actual fact, they are defence forts, built in the Second World War and named after their designer, Guy Maunsell. 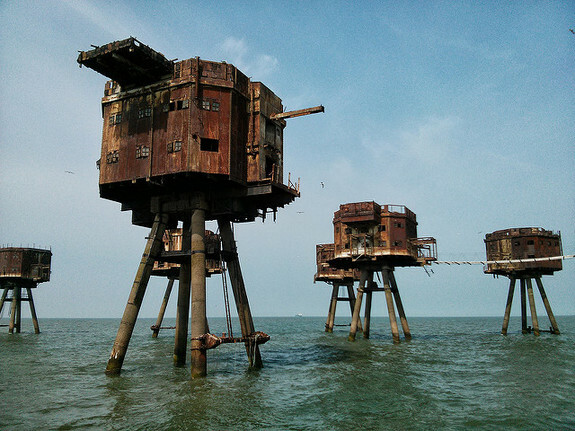 The Maunsell Forts went on to be used for pirate radio stations, but these days, they just stand around in the murky waters, looking pretty ominous. What could be creepier than a cave with a strings of teddy bears hanging from its mouth? This is the birthplace of Mother Shipton, a 17th-century prophetess who predicted many things, including the invention of iron ships and the Great Fire of London (as well as the end of the world… in 1801). 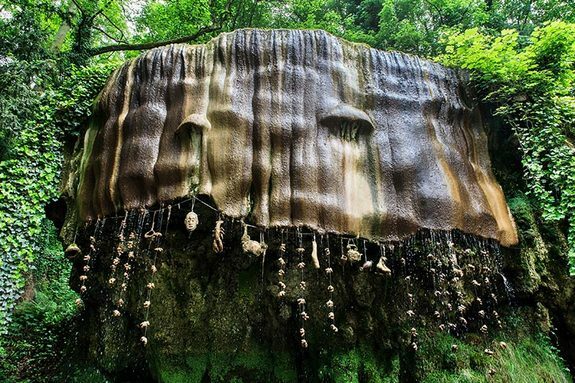 Said to be the UK’s oldest tourist attraction, Mother Shipton’s Cave was originally avoided by visitors who were too afraid to go there. 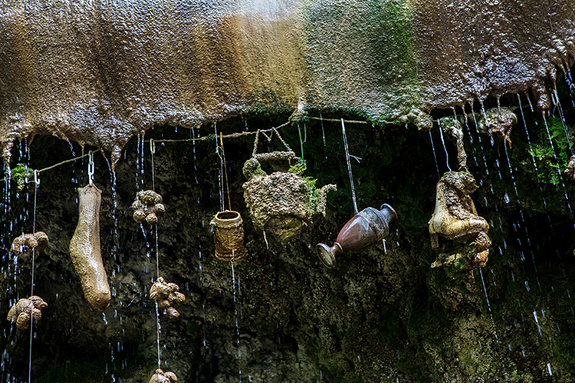 Legend had it that anything left at its Petrifying Well would turn into stone. As it happens, that bit is true, but only because of science: the high mineral content of the water there means that anything hung at its entrance will be petrified within three to five months. 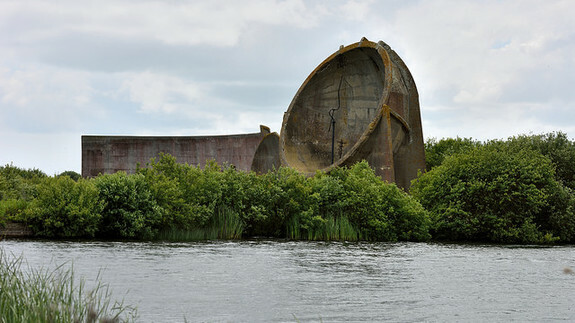 You may have seen a satellite dish before, or a telescope, but have you ever come across a sound mirror? Located near Greatstone in Kent, these huge structures are the last remaining monument to an early form of defence engineering. 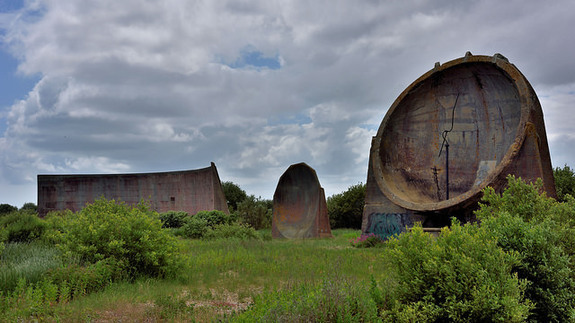 The sound mirrors (or concrete ears, as they’re often affectionately known) were built in the 1920s and 30s as a means of detecting the sound of approaching enemy aircraft. An early version of a radar, they did work, but became obsolete when advances in aircraft engineering meant that planes got faster. If this isn’t Mars, surely it’s North Africa? Actually, it’s Anglesey, in North Wales. 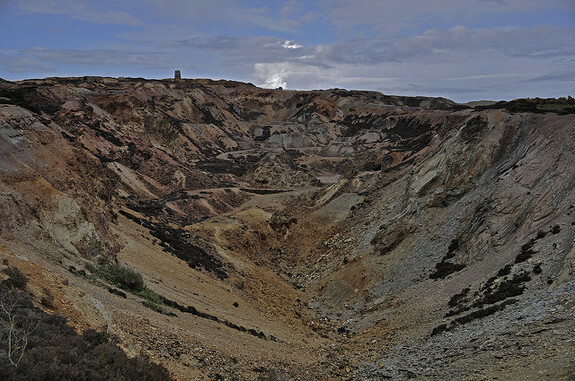 Parys Mountain is the site of a former copper mine that was in use from 4000 years ago. 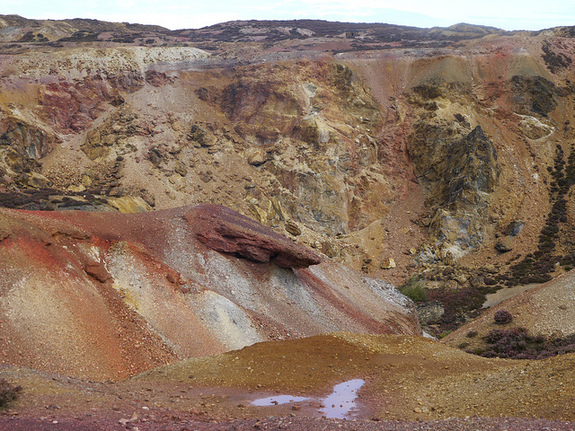 In the 1780s, it became the biggest copper mine in Europe and one of the world’s greatest sources of copper. The remains of the mining are what give the landscape its orangey hue, and what prevent most animals and plants from surviving there. Parys mountain has provided a dramatic backdrop for filming, including a scene in Mortal Kombat: Annihilation. While we’re on the subject of movie scenes, check out this place, which looks like it’s straight out of a scene from Indiana Jones. 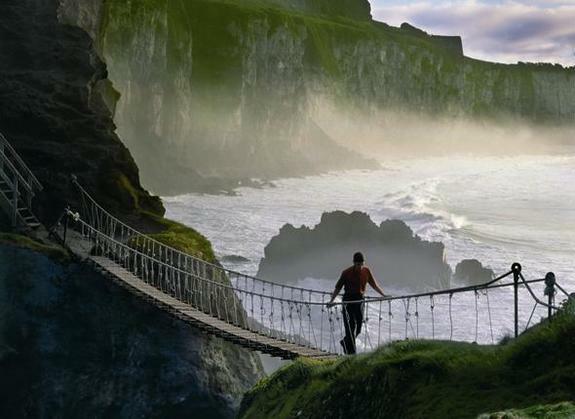 The Carrick-a-Rede Rope Bridge is suspended a heady 30 metres above the Atlantic Ocean in County Antrim, Northern Ireland. Measuring 20 metres across, it connects the mainland to a rocky island, where a tiny fisherman’s cottage is the only building. 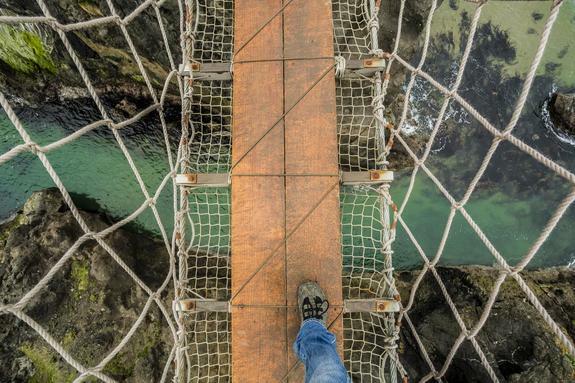 Despite the fact it was built by salmon fishermen 350 years ago, the Carrick-a-Rede Bridge is in good nick and open to visitors who dare to stride across. 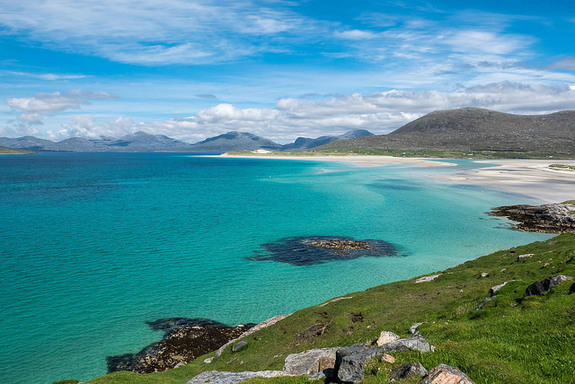 These images might look like they’ve come straight out of the pages of a Caribbean holiday brochure, but they were actually taken way further north than that, in the most westerly point of the UK: the Outer Hebrides islands, in Scotland. With pristine, powdery white sands and dazzlingly clear seas, it’s hard to believe that these scenes don’t come with tropical temperatures. That doesn’t stop brave wild swimmers dipping in though, if only for a few minutes. You might want to sip a dram of whisky afterwards, rather than a piña colada. This entry was posted on Thursday, January 18th, 2018 at 1:27 pm	and is filed under UK-Travel. You can follow any responses to this entry through the RSS 2.0 feed. You can leave a response, or trackback from your own site.